Description The ultimate Pokémon collector's book is landing in selected stores just in time for Christmas! 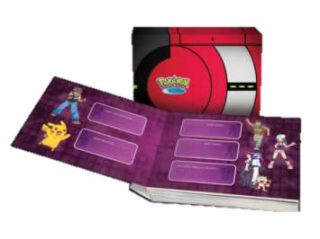 This release is the fourth Pokémon limited edition book and includes detailed region maps, information and statistics specific to the Sinnoh region. There's no place like Sinnoh, the next stop on Ash Ketchum's quest to become a Pokémon Master! Legendary powers maintain a delicate balance in the Sinnoh region, a modern land where ancient statues and ruins still speak of the mighty Pokémon Dialga and Palka - one said to be the ruler of time, the other of space. For Ash, there's no time to waste as he battles his way through Sinnoh, joined by his old buddy Brock and new friend Dawn, an aspiring Pokémon Coordinator. What new Pokémon will they meet, and which ones will they catch? These young Trainers can't wait to find out! Whether it's solar-powered Sunyshore City or frosty Snowpoint City, there's no place Ash won't go in order to challenge Sinnoh's Pokémon Gyms and earn a spot in the Sinnoh League tournament. Ash and his friends are as determined as they come, but this time they'll face rivals and foes that never let up. Ash's new rival Paul does whatever it takes to win, no matter the cost to his Pokémon. The ruthless poacher, Pokémon Hunter J, stops at nothing when it comes to kidnapping Pokémon for cash. Even worse, the relentless forces of Team Galactic have launched a plot to destroy all of Sinnoh - and the Pokémon world! Ash's Sinnoh adventure could prove to be his most epic challenge yet!